Description: Ortelius’s map of Central Africa, the first to show the legendary Kingdom of Prester John. Latin text on verso. Coloured. Description: Attractive map of the Congo and Angola with focus on the numerous rivers along the coast line. Coloured. Description: Glorious map of Central Africa showing the legendary Kingdom of Prester John. Original colour. Description: Early map of the west coast of Africa, stretching from Angola to the Democratic Republic of Congo and the Republic of Congo. Coloured. Description: Early map of Central Africa. Published as part of Hakluytus Posthomous or Purchas his Pilgrimis, contayning a History of the World in Sea Voyages and Lande Travells, by Englishmen and others. Coloured. Description: Early map of the Congo and part of Angola. Published as part of Hakluytus Posthomous or Purchas his Pilgrimis, contayning a History of the World in Sea Voyages and Lande Travells, by Englishmen and others. Coloured. Description: Central portion of Africa depicting the mythical Empire of Prester John in fine original hand-colouring. Description: Attractive map of the Congo and Angola. Much of Africa's interior was unknown at this time allowing geographers artistic licence in names and places. Coloured. Description: Empire of Prester John. Shows all Central Africa, from Ethiopia in the Northeast to Congo in the Southwest. German text on verso. Coloured. Description: Detailed map of the Congo in brilliant Dutch Golden Age style. A fine impression with decorative cartouche and sophisticated original hand-colouring. Description: Empire of Prester John. Beautiful map portraying the mythical Christian Empire of Central Africa. Coloured. 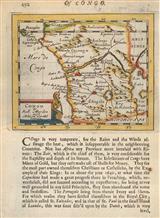 Description: Early minature map of the Congo, now including Gabon and Equatorial Guniea. Coloured. Description: Miniature map of the Congo, now with Angola. Focus lies on the Congo River and the Portuguese colonial city of São Salvador, now M'banza-Kongo. Coloured. 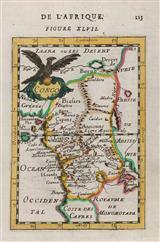 Title: : Royaume de Congo, &c.
Description: Attractive and early map of Angola and the Congo. Published by the formative founder of French cartography. Coloured. Description: Kingdom of Prester John. Original colour.